I just adore our little brood! We decided to add chickens to our ever expanding menagerie a few years ago and it's one of the best things we've done! 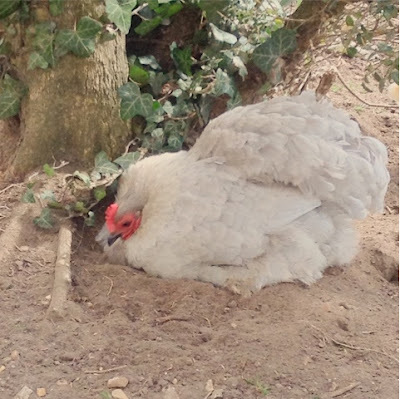 We chose bantams as they are little and we wanted to let them roam free around our cottage garden, bigger chickens destroy a garden in minutes. A friend of mine has had to have a run built for her large hens which seems a shame, but they ate and dug up everything in site. Bantams however cause minor disturbance although they are still partial to my primulas and ranunculus flowers, but they don't really do that much harm. The one thing they are great for when left to roam free is pest control, they eat all of the bugs and slugs except lady-birds which is a bonus. And the eggs.... Wow! Out of this world! They may be little, but they are all yolk, and as gold as gold can be, they are amazing to bake with! They take themselves off to bed at night and sleep in a converted coal bunker. We do sometimes have the odd stray when a hen is sitting broody somewhere and doesn't go home. Mr VGL and I were out in the pitch black last night with wellies on and phone torches out trying to find our missing tiny hen Bluebell, after much trampling across flower beds and a near miss with the pond we eventually found her tucked up inside the compost heap sitting on half a dozen eggs- there will be lots of baking tomorrow! Your 'Lavender' is quite precious.